A. Any dog on campus must be under the direct control of a person capable of controlling and actually controlling the dog by means of a hand held leash not exceeding six feet in length. If a dog is not controlled in this specific manner, it shall be classified as "At Large." B. Any dog on campus must have a valid County or City license attached to its collar. 1. A seeing-eye dog serving an owner. 2. University-owned dogs undergoing research applications. Persons observing violations of these regulations, persons involved in dog bites or having other problems involving animal control at UCSD may call these offices for assistance. 1. Any person in violation of City Dog Control Regulations will be subject to citation under these codes and the citations will be processed through the courts. These violations are described in Section II. A. and B.
a. Any "At Large" dog not in the vicinity of its owner will be picked up and turned over to the San Diego County Department of Animal Control by a representative of one of the above offices. See Exhibit A.
b. 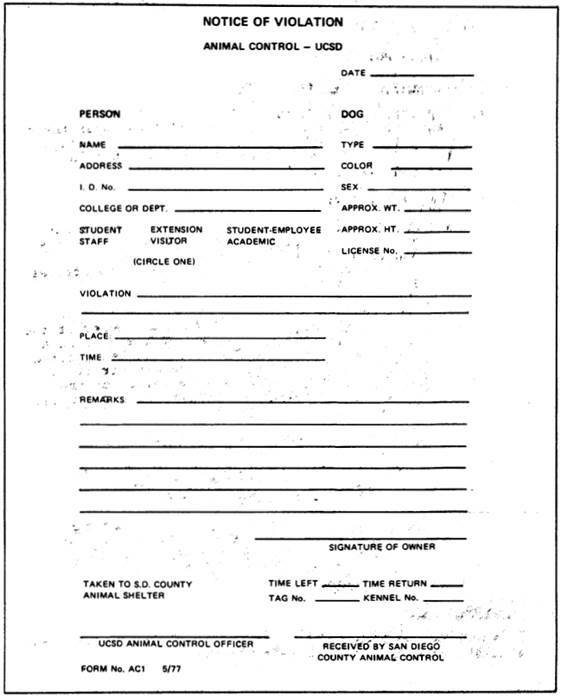 When an "At Large" dog is claimed by a nearby person, the officer will inform the owner of the campus policy and record the owner's name on a Notice of Violation form which will be reported to either the Vice Chancellor-Administration, the Vice Chancellor-Academic Affairs, or the Vice Chancellor-Student Affairs as appropriate. See Exhibit A. 1. Any unclaimed dog will be picked up and turned over to the San Diego County Department of Animal Control. 2. Any unclaimed dog will require informing the owner of the campus regulations and the recording of the owner's name for reporting to the appropriate Vice Chancellor. It shall be the responsibility of all UCSD faculty, staff and students to comply with these regulations.